Use the "attachments and other options" at the bottom of the post to upload pics directly. Don't recall ever seeing that on either of my C-10s. Are you sure it's from your bike? Can't even see the photo by following the link. 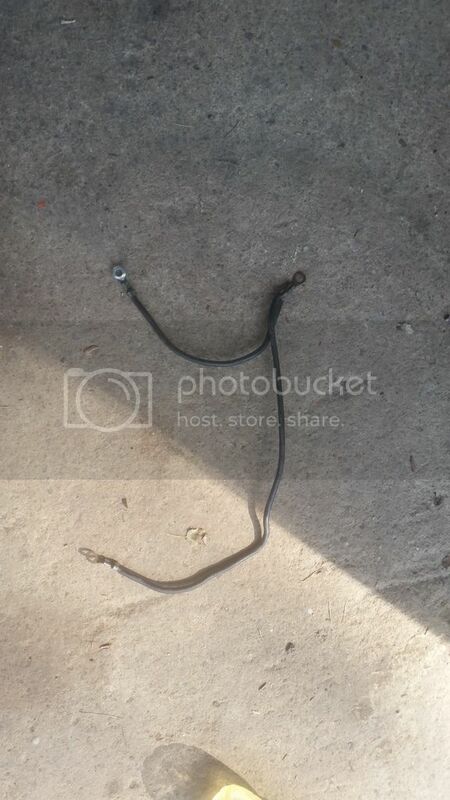 If the wire is black, it sounds like the ground harness for my old honda, battery, frame, engine. The C10 ground harness only has 2 bolt eyelets and 1 bullet connector. Ground wires on C10 are black/yellow. Did you pull it from your C10? The OP, Derg, his one and only post. Has not responded about where the wire is from. I downloaded the image and cropped it to fit. Anyone that dwonloads, and uses a third party software, to allow photobucket any further usage, deserves whatever happens... nothing against you personally, but I simply refuse to use any service related to photobuttlick any longer, after they hosed me, and everu other person using them... as far as I am concerned, they can try to pay bills now, on their own, with lessening money coming in from all their advertizers, ... I'm fed up with them. They completely hosed everyone that used them as a host. Sorry, I just won't download any more software from them, nor use them ever again... as far as my thousands of photos stored on their system... they can gag on them. The extension added to chrome was not created by photobucket. I'm only guessing it was created by some software writing geek type that got hosed by photobucket as well. I'm not backing photobucket in any way shape or form....never have, never will. I just want to see the pics. I would suggest that people click on attachments and other options and upload a pic to the COG site instead of using a third party site like photobucket. If they have a problem resizing the photo to meet size limitations, one method is to go to the photo on my computer using picasa (free from google) then email that photo using picasa to my gmail account. Picasa automatically resizes the photo to under 100k so when you download it from gmail to your computer, all the resize work is done and it isn't in the least bit difficult or technical. Easy peasy. If picture posters wouldn't keep using photobucket, I would have no need for the extension for chrome. Change comes hard and slow is all I can say.....and it rarely changes because I want it to. I can't change the rest of the world, but I can change what I do. Just trying to help if anyone will listen. Soooooo.....where does that wire go ? Doesn't matter. The OP doesn't care enough to fix the pic, or even return to further comment, I suggest this thread is going nowhere and should be locked until such time as the OP returns. Picture is there , clear as day . In Harry's post . How bout trying to help identify it for the potential new member rather than running him off . We all know how silly the picture posting is here . I rarely bother anymore . Some kind of grounding wire - I can't imagine where from though. Imho, that part is NOT of any ZG1000. Looks like the ground wire from a early '80s honda cb900. Battery, frame, engine (rubber engine mounts).